Incidentally, both new makeup items have skincare properties infused in them. Its fascinating to me. 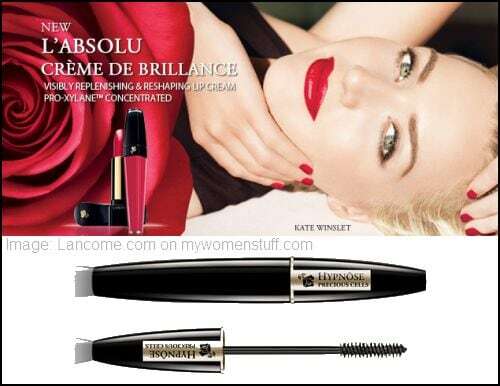 The L’Absolu Creme de Brilliance lip gloss has anti-aging properties to replenish your lips and it looks amazing on Kate Winslet in the ad. I believe her colour will be Rose Mythique – a colour I’d choose for myself too! As for the Hypnose Precious Cells Mascara, the online buzz is deafening! As reported, already lines are forming at the Lancome counter in Harrod’s awaiting this new mascara that promises to not only give the illusion of lengthened more volumized lashes, but also contains a lash stimulant to regenerate your lashes and leave them looking fuller and denser. The cells in the name refer to stem cells at the root of the lashes. So this new mascara acts also as a lash serum to strengthen lashes and prevent lashes from falling out. Would you want to give the Lancome Hypnose Precious Cells mascara a shot? I know I would because I’m curious that way plus I need my puny lashes to sit up and perform! 🙂 No news on the local front yet but once I know, I’ll let you know! Happy weekend! How are you spending yours? I’ll spend the morning cramming Psychology essays, and later I’ll go shopping with the family!! OMG, can you believe it, F1 season is back!!! Forza Ferrari!!! I’m spending my morning getting ready to go out for lunch with the folks. You won’t believe how much time is involved in getting baby and self ready! Have a good weekend dear. I’m gonna spend mine walking around in shopping malls!! And I’d love it if Lancome M’sia brings it in…..sounds promising! I know what you mean about the weather!